​In today's busy rush of life, we often forget to take the time to pay attention to the things that really matter. Our current ways of living and working have trained our brains to be fragmented and distracted, and this has resulted in decreased happiness, increased illness and reduced productivity. All of this has made it increasingly difficult ​to thrive. Fortunately, there is another way. Mindfulness, the practice of being aware of what is present in this moment and exploring that awareness with a curious and non-judgmental attitude, is a skill that can be learned. Neuroscience and research are increasingly showing that learning and practicing mindfulness helps us to change old habits, opening the door to new possibilities. Our work blends evidence-based practices with real-world practicality, delivered in engaging and informative programs. ​At work and in life, the capacity to sustain attention is critically important to being effective and productive. Seeing the reality of what is present is necessary for optimal performance. With mindfulness, perspectives are widened and calmed, rather than being narrowed and frantic, and much like "mental hygiene", mindfulness clears out the clutter so that the day can be managed with more efficiency, clarity and creativity. 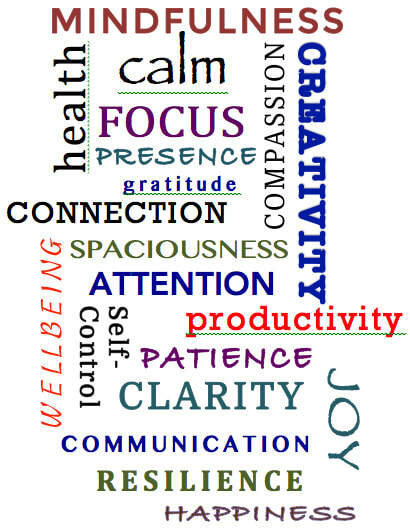 the many benefits of mindfulness.